Estormo is a Thalmor agent reporting to Ancano. He will confront you at the end of Labyrinthian during the related quest. When approached, he will converse with you briefly. Shortly afterward he will attack regardless of your response. He will barge through the metal doors to confront you and block the only exit, saying: "So, you made it out of there alive. Ancano was right... you are dangerous." He then tells you that "I'm afraid I'll have to take that Staff from you now. Ancano wants it kept safe... oh, and he wants you dead. Nothing personal." At this point you can either respond with "Get out of my way." or "I have no quarrel with you." but no matter what you say he will confidently reply with "You fool, you don't stand a chance." or "I am afraid you do." After this he will become hostile. 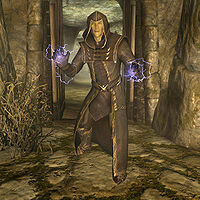 Estormo wears hooded Thalmor robes, Thalmor gloves, and Thalmor boots. He knows a number of spells, namely Stoneflesh, Conjure Flame Atronach, Chain Lightning, Flame Cloak, Lightning Bolt, Fast Healing, and Steadfast Ward. If you sheathe your weapon, he will accept your yield.